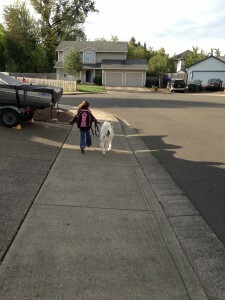 Toby and Brinley have been walking to school every morning and then we walk to pick her up in the afternoon. Toby is such a sweet and loving dog that all the kids want to pet him. He loves the attention. However when Brinley goes to her class he gets a little upset because she is leaving with out us. I don’t blame him I feel that way too. She turns and gives a quick wave and then she is gone in the sea of children. It is a bitter sweet moment every single day. In the afternoon Toby sits and waits patiently for his kid to come out of school, thankfully she is one of the first out as she is a first grader. Once they see each other it is so sweet. He continues to sit there patiently until she has said her good byes to her friends and her teacher. Then we walk the half mile home. This morning tho I was really impressed. Toby was sitting and awaiting while the kids took turns to pet him. Like always just sitting there and soaking up the attention from kids (they are his favorite). Today I was more impressed with the children. They all took turns as to not overwhelm Toby and three of the children remembered that he would be there and brought him dog treats. I couldn’t believe that this early into the year that Toby would be so important to the kids at the school. They each ask if he will be there in the afternoon. I can generally with out fail tell them that he will be there. This morning Toby was recognized by the principal and given some petting. Then he looked at Toby and told him to keep up the good work. I am glad that our family dog can bring some joy to the other students at the elementary school. His walking to school is doing more than just exercise as we walk a total of a mile back and forth twice a day. So we are getting our 2 mile walk in (which exhausts him and me) But he is also making kids smile which is a great feeling. Here is a pic taken this morning on the way to school. This entry was posted in family updates and tagged dog, elementary school, friends, Irish red and white setter, Keizer, kids, love, oregon, School, Toby, Waiting.